The great thing about the Smoky Mountains is the natural way the trees cool down the environment. I bet you didn’t know this, but a single tree is like having ten air conditioners operating 20 hours a day! The evaporation from the tree leaves removes heat energy from the air. Okay, so maybe that’s enough science for you. How do you beat the heat in the Smokies besides enjoying the scenery? We have five awesome places you should hit up. This is a great spot for singles, couples, and families to all enjoy. 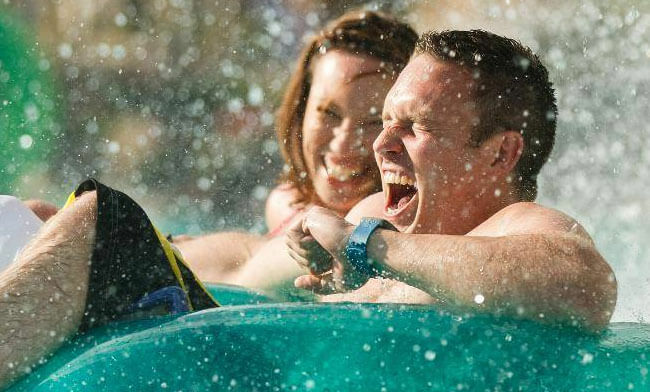 Located in Pigeon Forge, and a companion to Dollywood proper, Dollywood Splash Country is our choice for a great waterpark in the Smokies that’s full of fun! You’ll find water slides, rafts, waves, and plenty of places that even little ones can enjoy. 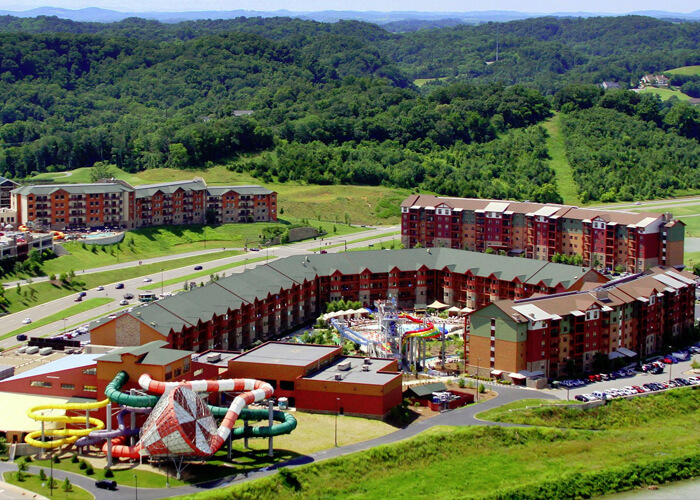 If you want to chill out, enjoy the majesty of the Smoky Mountains while you float down the 1,500-foot lazy river. Enjoy bobbing up and down in the 25,000-square-foot wave pool. Your toddlers will love Little Creek Falls—an area just for kids with fun slides and activities guaranteed to cool them off. Retreats and Canopies are private seclusion you can rent if you want a little more privacy. Dollywood Splash Country is open from mid-May through Labor Day. Located in Townsend (just 20 minutes from Pigeon Forge), this cave system is known as the “Greatest Site Under the Smokies.” It’s probably also the coolest year-round, just because the air under the earth is naturally 58-degrees. The air is so cool they use it to air-condition the gift shop and visitor center! The history of the caverns is broad. Since they first opened to the public in 1931, the caverns continue to be explored. Visitors can view those explorations like the Big Room and Silver Falls, a 200-foot waterfall. If you want to see the Smoky Mountains from a different angle, try the Tuckaleechee Caverns! 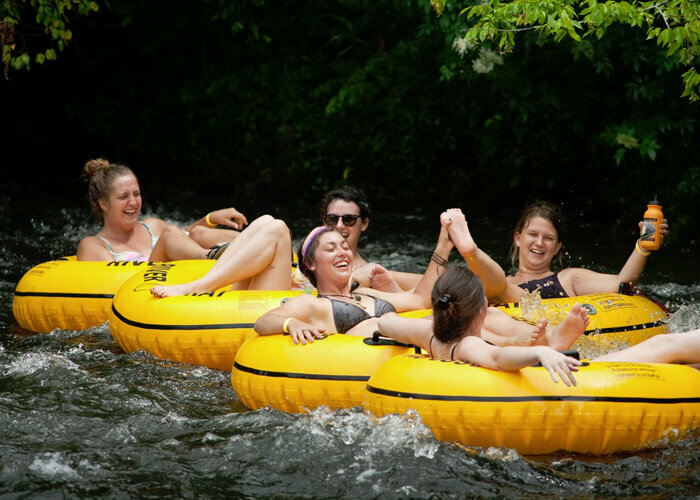 For thrills and spills (and little chills), get on a yellow inner tube and head down the Little River in Townsend. Smoky Mountain River Rat is a family-owned and operated business and will give you a personal experience at rates that are good all day. If you have kids under age five, they are free. If you are more into whitewater rafting, take a trip with their other company, USA Raft just outside Gatlinburg, TN on the Pigeon River. What could be better than that? Well, they also offer a “Daycation” package (through USA Raft), which offers Upper Pigeon whitewater rafting, Lower Pigeon kayaking/rafting, lunch, and then river tubing with River Rat, all for one flat rate. You better put on your swimsuit and towel and plan to get wet and stay cool, because they don’t have dry rides in the summer. 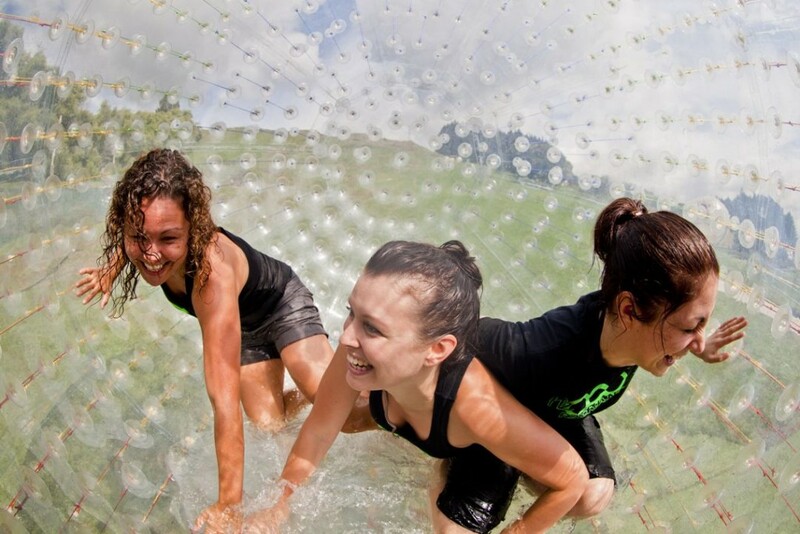 Take yourself and up to two other friends and head into a zorbing experience in Pigeon Forge that you won’t forget. You will enter the H2OGO Ball at the top of a 1,000-foot hill and get drenched in ten gallons of water as you slide around inside the ball as it rolls down the hill. Do you want more water? Take on the Fishpipe barrel, which is filled with 20 gallons of water and spin stationary at up to 45 turns a minute. You can control your rate if you are more into lots of water and not lots of speed. For shorter waiting times, call ahead or visit the Outdoor Gravity Park before 11 a.m. or after 4 p.m. There is yet another waterpark in the Smokies for you to check out. This is a hotel with waterparks! For those looking for a place to stay and cool down, this is the spot for you. You have to be a guest of the resort to use the waterpark, but it’s great if you want to plan some water fun and not worry about the weather as they have an indoor section called the WaterDome. Outside features two separate parks. One has a lazy river and wave pool beside some great water slides. The other is perfect for smaller kids with a 4-story play structure that features three slides and play-and-spray. Located in Sevierville, Wilderness at the Smokies is perfect year-round. Even if you don’t feel like water, their 25,000-square-foot Adventure Center will keep your kids engaged with a ropes course, laser tag arena, arcade, and other attractions. Ready to book? Visit their website. We hope our list was enough to get you ready to grab a swimsuit and towel (or a jacket if you are heading to the caverns) and cool off during your Smoky Mountain vacation! Don’t worry about bookmarking each brochure. Instead, sign up on MobileBrochure.com and add your favorite locations to your brochure suitcase. We’ll keep them handy for you so you can get back to them quickly when you arrive. Great suggestions! We come up about four times per year and we are running out of new things to try. Of course we love the park and love to swim in the river! I would suggest going into the park and taking the road to Cades Cove, then find a place to pull off and swim! Water shoes are a must, as well as a change of clothes, towels, camp chairs, snacks, drinks, and a picnic lunch! It’s always cooler under those big beautiful trees!